Ah, your credit score… a number that controls so many aspects of your financial life. It is the barometer of your fiscal responsibility and can be very revealing about your relationship with money. A bad score can be quite costly and affect your finances in various ways, down to the ability to get hired for a job. 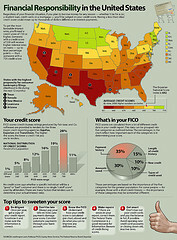 Having a good credit score will serve you well and if it is less than stellar now, there are some ways to improve it. A lot of factors determine your credit score and the ability to make timely payments to your creditors accounts for 35 percent of score calculation. If you are forgetful or have the tendency to put off paying bills to attend to other financial issues, that are often times not as important but more desirable to take care of, set up automatic payments. If you are falling behind and having trouble paying the full amount, stay in touch with your creditors. It may not prevent them from reporting the payments as being marked late, but it may prevent them from closing the account or sending it off to a creditor, both of which will further worsen your credit score. I remember one time I fell quite behind on a credit card payment and was not able to catch up to the full amount for several months; but the whole time I made partial payments and kept in contact with the company, letting them know when to expect payments and what amounts; they could tell I was making an effort and it worked in my favor. You may be tempted to accept every credit card offer that comes way to make your debt to available credit ratio more attractive, but this is not the best way to go about it. Constantly acquiring new lines of credit could raise red flags. If you have a long history and multiple lines of credit in good standing, this may not be as much of an issue. If you’re relatively new to the credit game and you are opening up lots of new accounts in a short time, particularly while carrying balances on current accounts, this will likely negatively impact your score. On the surface, it would seem smart to reduce the amount of credit cards you have because that would make you look more financially responsible, right? But, how much debt you have relative to how much available credit is a major factor in determining your credit score. By closing unused accounts, you are reducing the amount of available credit and your debt ratio will go up, causing your score to drop. Now if you are looking to close those accounts because you do not trust yourself to keep them unused, that is a different story and it might be worth the temporary hit. If you do keep any active, make it the oldest one as a longer credit history is more favorable when it comes to scores. So, the moral of the story is, do not close unused accounts solely as a means to raise your score. If you are carrying the majority of debt on one or two cards while the others are free and clear, Bankrate.com recommends transferring some of the balance to the other cards. A more balanced distribution of credit can work in your favor score-wise. Having a good credit score will give you peace of mind and save you money when it comes to making major purchases. The variation in interest rates between scores may seem small, but when you are talking about purchases of tens or hundreds of thousands of dollars, getting that extra .5 percent rate will make a world of difference in the long run. Kelli Cooper is a freelance writer who loves helping her clients grow their business. If you are in the market for a credit card in Canada, check out http://www.kanetix.ca/credit-cards to compare multiple options.